LOS ANGELES -- The biggest surprise for Nneka Ogwumike in her first season in the WNBA? Just how easy it was. Well, maybe she didn't put it exactly like that, but as the Los Angeles Sparks forward accepted the WNBA Rookie of the Year award Sunday morning before Game 2 of the Western Conference finals, she talked about how "smooth" her transition into the professional game has been. Jon SooHoo/NBAE/Getty Images Both coach Carol Ross and Nneka Ogwumike are in their first season with the Los Angeles Sparks. She did it while sitting next to Carol Ross, who also was named the league's coach of the year after leading the Sparks to a 24-10 regular season. I haven't had any complaints about how they have helped me develop this season, and I couldn't have asked for a better place to be. It's not just a program, it's a family, and I'm all about that type of situation." Blessed with remarkable athleticism and composure, Ogwumike was mentored all season by Candace Parker, the runner-up for the WNBA MVP award, and DeLisha Milton-Jones, a 14-year-veteran. 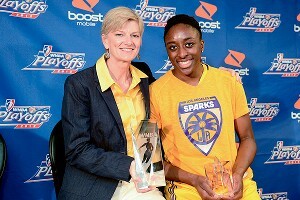 Ogwumike averaged 14 points and 7.5 rebounds in her first professional regular season and made an immediate impact, helping the Sparks' contend for the league title. Ross said Parker and Ogwumike have made a potent combination in the frontcourt. And they made her job easier. "Any coach would be fortunate to coach either one of them, much less both," Ross said. "Both bring different things. Candace has already experienced so much, and for Nneka to be able to play in that tandem and have some on-the-job training while she's growing as a pro player has been beneficial. "We have the youth and energy and enthusiasm of the best rookie in the league in Nneka and the experience and wisdom of one of the most talented players in the world in Candace Parker. It's been great for them to work together." Ross is in her first season with Los Angeles after serving as an assistant in Atlanta, where as the Dream's defensive guru she helped them to two straight trips to the WNBA Finals. Ross, who feels fortunate to have inherited a roster full of both experience and talent, said it was her goal this season to teach her team to overcome adversity. "That's been one of the biggest things with this team, to get through the tough stuff," Ross said. "Anybody can play when everything is going your way. But how do you bounce back?" LOS ANGELES -- Sparks coach Carol Ross never doubted that she had a scorer on her team in point guard Kristi Toliver. Whether Toliver could put the ball in the basket was never the issue. But Toliver marked the 2012 season by rounding out her game in a few more very important ways. The fifth-year player from Maryland shook off previous disappointments. She became a distributor and a defender. And on Thursday, as the Sparks were preparing to open the WNBA playoffs against the San Antonio Silver Stars at the Galen Center, she officially became the WNBA's most improved player for 2012. Toliver stopped warming up and walked over with a shy smile to talk about an honor that felt hard-won. "I'm going to enjoy it because it's proof that hard work pays off, all the hours in the gym and outside of the gym," Toliver said. "The persistence and resilience that I've had in my pro career, the success and good things didn't happen right away, and it's nice that it's all paying off now." Toliver started 33 games for Los Angeles, establishing career highs in scoring (17.5), assists (4.9), rebounds (3.2) and steals (1.3), as well as field goal percentage (.491) and minutes (31.5 mpg). Her offense propelled Los Angeles into the postseason, as she scored at least 20 points in every game in August and was the Western Conference player of the month. "It's a credit to all her hard work and her belief in herself," Ross said. "To see it all come together, for her to have success, it's not a secret anymore. Everybody is acknowledging it now, really, what I think people should have known all along. She's a heck of a player." Earlier in her career, Toliver was a scoring spark off the bench. Now, she's a go-to talent with all-around game. "To not just shoot, but be a great distributor, and her ability to pass has been under-acknowledged," Ross said. "On the defensive side, she's been more engaged, more accountable. She's wanted to be complete. This isn't football, you don't sub out when you cross half-court. She has embraced being a complete player." "I feel like there's belief that I can be an elite player at this level, but I'm not there yet," Toliver said. "I wanted to be higher in the league in assists and I was fourth, and that's a step. That will be another goal for me, to be the top assist person. "I'm never satisfied, that's how I'm built. I was sixth in scoring and fourth in assists and I want to be No. 1 in both. That's just how I approach things." It looks like a "changing fortunes" kind of week for the Washington Mystics. And if any WNBA team needs a new direction and new blood, it's them. They ended the regular season Saturday with a 5-29 record, somehow doing even worse than last year's moribund 6-28. Just two years removed from finishing first in the Eastern Conference, the Mystics seem eons away from that kind of success. So what can stop their downward spiral and give their exasperated fans hope for 2013? David Butler II-US Presswwire Trudi Lacey went 11-57 in two seasons as the Mystics' head coach. The first essential step came Monday, with the announcement that the team and coach/general manager Trudi Lacey were -- as the Mystics' news release said -- "parting ways." The team also did not retain assistant coaches Marianne Stanley and Jennifer Gillom, both of whom are former head coaches in the WNBA. Lacey, the architect of two consecutive teams that went nowhere, was hired in November 2010, a time that will live in infamy in Mystics' lore. Washington had, for the first time, finished in first place in the Eastern Conference earlier that year under the guidance of coach Julie Plank and general manager Angela Taylor. Despite Washington's first-round playoff loss to Atlanta, it looked like the often-snakebit Mystics finally had found a really good blueprint for consistent success. Then, apparently over salary and/or control issues, it all blew up. Taylor left, and Plank did not want the combo job of coach/GM. There was an infamous teleconference in which Mystics president and managing partner Sheila Johnson told the media that she would "idiot-proof" for them her explanation of what went down with Plank's and Taylor's departures. Instead, the Mystics' management looked clueless and desperate, with Johnson referring to the just-hired Lacey's chances for success as a "crap shoot." It was a losing move for Washington, which now will try to turn the tide yet again. Whoever is hired will be the 13th coach in the history of a franchise that began play in 1998. The Mystics have been to the playoffs six times, while subjecting their fans to now four seasons of only single-digit victory totals. Will the Mystics now hire two people -- one a coach and one a GM -- or go with a combo job again? That decision will impact who might be candidates for the Mystics to consider. Getting the No. 1 pick, especially, and a new mentor might not cure everything that has ailed the Mystics the last two years, but could go a long ways to doing that. Another factor in the hiring(s), though, will be how Wednesday's draft lottery goes. The Mystics, with the league's worst record, have a 44.2 percent chance of getting the No. 1 pick in the 2013 draft, which seems a virtual lock to be Baylor center Brittney Griner. So the Mystics organization will already know its lottery position before it hires its next coach, which could make the job more attractive and could also impact whom the franchise prefers to be in charge of X's and O's. The Mystics "celebrated" their 15 seasons in Washington this summer, but that was bittersweet at best, coming in the midst of so many losses. Post player Crystal Langhorne had another solid season, averaging 14.7 points and 6.3 rebounds. She turns 26 in October, so she's still in the heart of her prime as a pro. But Langhorne needs more help, and the Mystics need a major confidence boost. They lost their last 13 games in a row and won just once on the road all season. Add to the team's frustration that former Mystics star Alana Beard has had a very good comeback season for playoffs-bound Los Angeles. She signed as a free agent with the Sparks after missing the past two seasons in Washington with ankle problems. Getting the No. 1 pick, especially, and a new mentor might not cure everything that has ailed the Mystics the past two years but could go a long ways to doing that. If, that is, the lottery balls fall in the Mystics' favor and the team's management makes a wiser decision when handing over the reins. The Mystics have plummeted a long way in the past two years. Now is a chance to start climbing back out of that hole. The participants in the WNBA playoffs and the draft lottery are now set. Washington, Phoenix, Tulsa and Chicago -- which lost Thursday and was eliminated from postseason contention -- are the teams that will be in the Brittney Griner sweepstakes. We'll have a whole lot more on that topic next week, in preparation for the live "SportsCenter" announcement of the lottery results Wednesday. There's plenty of ground to cover in that regard, including the considerable ire directed toward Phoenix by some other teams' fans, while the Mercury's own supporters seem quite OK with just letting 2012 go and looking toward 2013. Ron Chenoy/US Presswire Brittney Griner, the 6-foot-8 star who led Baylor to a 40-0 record last season, is expected to be the top pick in the 2013 draft. But this last weekend of the regular season, about all that's left to decide is which team ends with the worst record in the WNBA. Right now, that's 5-27 Washington, which finishes Friday against Indiana and Sunday at Chicago. The Mystics have lost 11 in a row, but are playing two teams with nothing on the line. The Fever's playoff spot is set, as is the Sky's position as the team with the best record in the lottery. Still, it seems a safe bet that even against even those unmotivated foes, Washington will continue sinking until firmly settling on the bottom. Most chances in the lottery, here we come. Meanwhile, the team with the second-worst mark is Phoenix, which at 7-25 has lost five games in a row. The Mercury finish Friday against defending WNBA champion Minnesota and Sunday against Seattle. That finale will be televised at 3 p.m. ET Sunday on ESPN2. Not exactly a barn burner. The Storm, who also have two regular-season games left, realistically are thinking about their first-round playoff series against the Lynx. Minnesota went 3-1 against Seattle this season. The Storm are not coming into the postseason with a full head of steam, having gone 5-8 since the Olympic break. Seattle hosts another playoff team, San Antonio, on Friday. And on the other side of Sunday's matchup in Phoenix, you have the tattered remnants of the Mercury, a team besieged both by myriad injuries and rumors that at some point this season, they rolled over and played dead. Phoenix coach Corey Gaines says that's nonsense. He says that, in fact, the Mercury did what they could to be competitive until the playoffs were mathematically impossible to reach, and then they decided there was no reason not to shut down star Diana Taurasi and give her rest. Whether you believe that or subscribe to one of the various Mercury tanking theories, this much is not debatable: Phoenix will benefit next year from the advancements players such as DeWanna Bonner have made in their games. Bonner, in her fourth year out of Auburn, has become a starter this season and carried a huge load. Phoenix president and chief operating officer Amber Cox praises Bonner for keeping the Mercury's attitude as upbeat as possible. "You can give her a ton of credit for that, because she really has been the leader of this team," Cox said. "She's been the one to make sure everybody keeps working hard. But also become more of a vocal leader in a positive manner." In this clunker season for the Mercury, Gaines insists that his players consistently attempted to play hard. "Our game is up-tempo and we'd have games where we just ran out of gas," Gaines said. "Even when games got out of hand, we had to strive for some kind of goal. Like, 'Let's try to win these next few minutes.' You have to do that, and that's what we did." Meanwhile, Tulsa's goal was simply to get as many victories as it could in a season in which the Shock again were often at a pure-talent deficit against foes. Tulsa is now 9-23 after winning its third game in a row Thursday, beating New York. In their two previous seasons in Oklahoma, the Shock went 6-28 and 3-31. Liz Cambage's decision not to return to Tulsa for the last 10 games hasn't dampened any of the Shock's enthusiasm for finishing this season as strongly as possible -- even if that gives them worse odds in the lottery. It seemed fitting that the final Eastern Conference playoff spot was clinched by a team on a night when it lost. Neither New York nor Chicago grabbed the East's No. 4 spot with gusto. It went to the Liberty, and the Sky again are left on the outside looking in at the playoffs. Some might say it's just as well, that Chicago potentially might benefit more from the lottery in 2013 than by making the franchise's first postseason appearance now. Still, it has to be looked at as a disappointment for a team that appeared to have a good chance at making the playoffs this season. maybe not so fast on that repeat thing. But, now, it again appears we might already know the winner for this year's WNBA race. Since the Olympic break ended, the Lynx have looked like they're ready to make like Usain Bolt on the rest of the league. 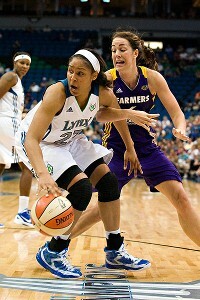 Tuesday in Minneapolis, the Lynx beat Los Angeles 88-77, giving Minnesota its ninth consecutive victory. And they did it in the now-standard Los Lynx way: spectacular performances from their two superstars, Seimone Augustus and Maya Moore, excellent game management from point guard Lindsay Whalen, very solid interior defense, and good contributions off the bench. Marilyn Indahl/US Presswire Maya Moore tied a Lynx record with five first-half steals Tuesday en route to a career-high seven. How do you beat the Lynx? When they're playing like this, nobody else in the league can. It was a historic night for Augustus, who passed Katie Smith to become the franchise's all-time scoring leader. Of course, it was a very different Lynx franchise that Smith played for -- one that had little postseason success and always seemed mired in mediocrity. One of Minnesota's low points was trading away Smith in 2005 for what ended up being essentially nothing. But Augustus arrived the next year, as the No. 1 draft pick in 2006, and that was when you could perhaps start to see the faintest light at the end of the tunnel. Well, maybe. Truth is, it was still hard to find a lot of optimism about the Lynx even then. Augustus got through those hard times, though, accepting the fact that much of the franchise's future was on her shoulders. She was more than happy to share some of that load with the Lynx's No. 1 draft pick in 2011, Moore. And all the parts that have surrounded them last season and this one have fit pretty perfectly, too. Moore said at the start of 2012 that the challenge for the Lynx would be to stay as hungry as they were last year when they were chasing the franchise's first title. Well, the Lynx appear to be just as ravenous now as they were a year ago. Augustus had 23 points and four assists against the Sparks. Moore had 23 points, nine rebounds and a career-high seven steals. She threw in two assists and a blocked shot, too. If you wanted to do an instructional video on hustle from a great player, this game by Moore would be fantastic footage. Rebekkah Brunson and Taj McWilliams-Franklin led the effort to clog up the Sparks' inside game. Guard Alana Beard led the Sparks with 17 points, and she's really coming into her own again offensively. Since the Olympic break, Beard has scored in double figures in six of the Sparks' seven games. The problem is, the Sparks are not playing as well on either end of the court as they need to. It seems pretty clear that center Candace Parker is not physically 100 percent; on Tuesday she had just six points on 3-of-8 shooting. The Sparks have lost three in a row. They have two road games left before finishing out the regular season with four at home. The best news L.A. has right now is that next up is the team with the league's worst record, 5-22 Washington. The D.C. fans are likely to give a warm greeting to former Mystic Beard, but she will have serious business on her mind in trying to get the Sparks out of this slump. 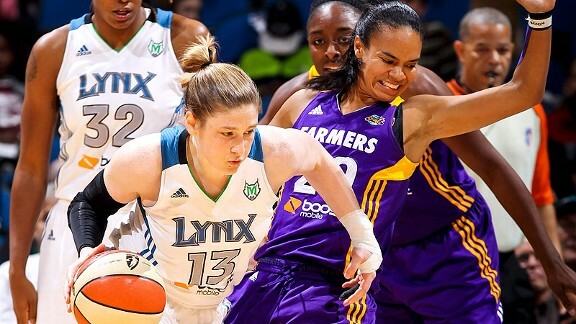 Now four games back of first-place Minnesota in the West, it seems unlikely that the Sparks are going to catch the Lynx. Instead, L.A. has to concentrate on getting Parker in as good a shape as possible for the postseason, and trying to go into the playoffs with some momentum. That's something the Lynx have in abundance right now. The biggest challenge Minnesota faces for the rest of the regular season is weariness from travel: The Lynx play six of their last eight games on the road. If any team is prepared for that grind, though, it appears to be Minnesota. The Lynx look ready for anything. What's next after 40-0 for the Baylor women's basketball team? How about a little running-and-gunning with Kentucky? A journey to Hawaii, where Stanford awaits? A trip to Notre Dame for a rematch of the 2012 national championship game? A visit from a new-look Tennessee team? All that will happen before December's over for defending NCAA champ Baylor, which hopes to end the 2012-13 season with another title -- this one in coach Kim Mulkey's home state of Louisiana. And yes, we know that Mulkey strongly dislikes that term "defending." As she puts it, Baylor isn't defending anything, because it has already won the 2012 title and that can't be taken away. Regardless, the question "Can Baylor repeat?" is the biggest storyline going into the upcoming season. The Lady Bears will be going for their fifth Big 12 tournament title. Baylor then will be a host for the early rounds of the NCAA women's tournament. After that, the NCAA regionals are in Oklahoma City; Spokane, Wash.; Norfolk, Va.; and Trenton, N.J. So if Baylor is the overall No. 1 seed again as it was in 2012 -- and advances out of the early rounds, of course -- the Lady Bears likely would head north for regional play in OKC (about a 4½-hour drive from Waco). Admittedly, that's all quite a ways down the road. But it's easy to get caught up in looking ahead, considering that Baylor brings back all its starters, including reigning national player of the year Brittney Griner. On Dec. 5, Baylor will take on a Notre Dame team that the Lady Bears defeated 80-61 last April at Denver's Pepsi Center in the national championship game. Then on Dec. 18, Tennessee -- another team knocked out of the 2012 NCAA tournament by Baylor, in the Elite Eight -- comes to the Ferrell Center under Holly Warlick, who officially took over as head coach after Pat Summitt moved to an emeritus role this spring. As for Big 12 conference play, one of Baylor's biggest rivals in recent years is no longer involved. There will be no more grudge matches for the foreseeable future with Texas A&M, which left the Big 12 along with Missouri to join the SEC. Mulkey made it abundantly clear last year she wasn't keen on starting a nonconference series with the Aggies. But Baylor will interrupt conference play to travel to Connecticut; that game will be Feb. 18. The Lady Bears open Big 12 play with league newcomer TCU, the Fort Worth-based school that's had consistent success in women's hoops under coach Jeff Mittie but now will be playing on a bigger stage. The other Big 12 newcomer, West Virginia (yes, it's still hard to believe), will get its "welcome to Waco" on Jan. 19. Baylor's matchups against a Texas team starting a new chapter under coach Karen Aston are Feb. 9 in Austin and Feb. 23 in Waco. 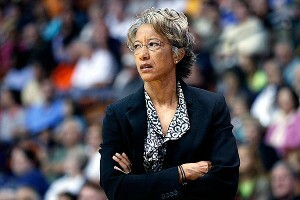 During Aston's years as an assistant, she had two stints working at Baylor. The target will be on Baylor's back all this season -- but that's nothing new. It really was last season, too. Mulkey didn't try to lessen expectations in 2012, and after the NCAA title game, she was already looking ahead to making a run at New Orleans in 2013. "That's my home state, and I won't have enough tickets for family," she said in Denver. "But I'll do something to get them in the arena. That's what we want, another national championship." and two frustrating NCAA tournament losses to Notre Dame. The Huskies' only senior sat mostly dry-eyed at her locker room stall at the Pepsi Center following an 83-75 overtime defeat at the hands of the Irish on Sunday. She talked about being happy with a great run in her college career, but not feeling satisfied. Occasionally, tears welled in her eyes, but she fought them off. "We gave this game away," Hayes said, upset by her team's turnovers -- she had six of the Huskies' 21 -- and failure to box out at crucial moments. "It's really hard; you want to be in that final game." AP Photo/David Zalubowski Tiffany Hayes had 10 points and six turnovers in her final game for UConn. Hayes was a complementary player her first three seasons at UConn, playing alongside the likes of Maya Moore, Tina Charles and Renee Montgomery. This year, Hayes was depended on more, and she came through much of the time. In late January, she had back-to-back games in which she scored 35 and 33 points against Syracuse and then South Florida. It was a slice of Hayes at her slashing and jump-shooting best. And in the Kingston Regional, she was pivotal in getting the Huskies into their fifth consecutive Final Four. Hayes had 32 points and 14 rebounds combined against Penn State and Kentucky in being named the regional's most outstanding player. After the Elite Eight victory against the Wildcats, UConn coach Geno Auriemma said of Hayes: "Tiffany's grown up a lot. Being MOP was one of the highlights of her career. I'm thrilled for her." And Hayes fully acknowledged then how her inconsistency over the years -- for which she got heat from both Auriemma and the UConn fan base -- had bothered her. She was hoping to prove at the Final Four that she wasn't going to follow a peak with another valley. But Sunday's game is not one for which she'll have any fond memories. Along with the turnovers, Hayes took some out-of-control, wild-looking shots. Other times, she didn't seem to be looking to make a play at all, even when the Huskies really needed someone to step forward. Hayes was 4-of-11 from the field and 2-of-4 from the foul line for 10 points. "We could have done a lot of things differently, but we're a fighting team and we didn't give up," Hayes said. "It was about all hustle plays for both teams. I don't want this to end now, but it was a good four years." Hayes said when the buzzer went off, the thought that went through her mind was, "That's it. That's it for me. But I also knew that, like coach said, they are definitely going to be back." DENVER -- Amid all of the hoopla that is NCAA Final Four weekend -- the bands, the practices, Tourney Town, hoops fans wearing newly made Peyton Manning Broncos jerseys -- there will be one moment that will be long remembered for years to come. And it was a moment that came even before the first tip-off. 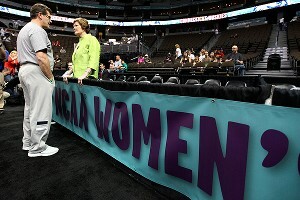 AP Photo/Eric Gay Geno Auriemma and Pat Summitt shared a brief moment during UConn's practice Saturday at the Women's Final Four. A woman wearing a bright chartreuse jacket made her way out onto the Pepsi Center floor. Not too long after she arrived, Connecticut coach Geno Auriemma made his way to the woman, and the crowd noticed. It was Tennessee coach Pat Summitt, who was here to show support for forward Glory Johnson during Saturday's State Farm All-America Team ceremony. Auriemma and Summitt, two college basketball coaching legends simply sharing a moment for the whole arena to see. Before long, fans moved in, asking Summitt for autographs; other admirers yelled from afar. "Come back next year, Coach!" And that's what made the scene that much more powerful: the unknown. Will Summitt return for 2012-13 after revealing before the start of this season that she was diagnosed with early onset dementia? Many will speculate her future for weeks to come. On Saturday, at least, the women's college basketball world simply appreciated Summitt was where she belonged.